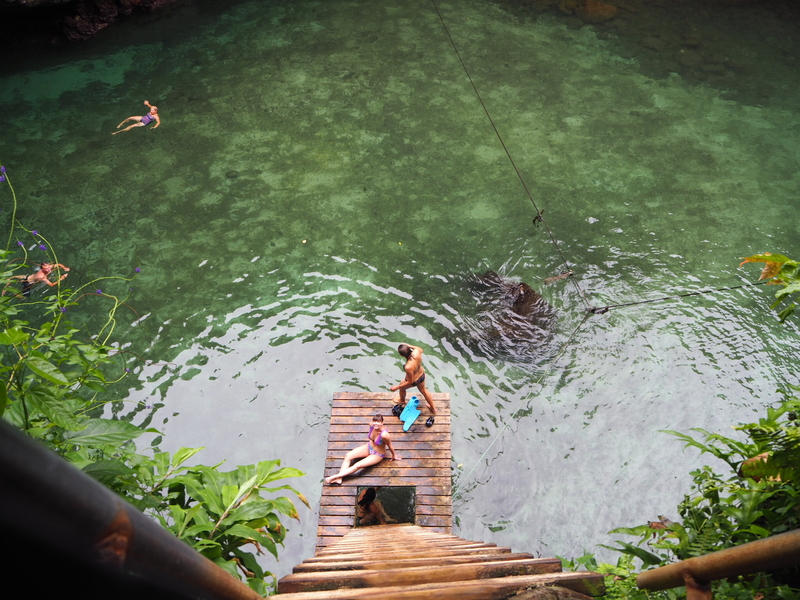 Commonly referred to as The Gateway to Samoa, Upolu is full of not to be missed experiences and activities. We couldn’t wait to get out and explore and after a few days of relaxing at the resort, we were itching for some adventure. 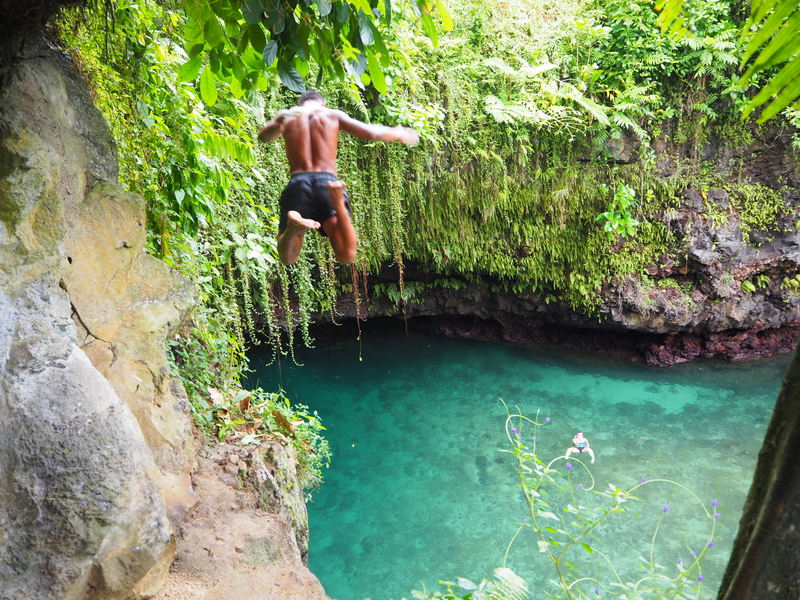 First stop was the sight we wanted to see the most and the first thing people told me I must do when they heard we were visiting Samoa. 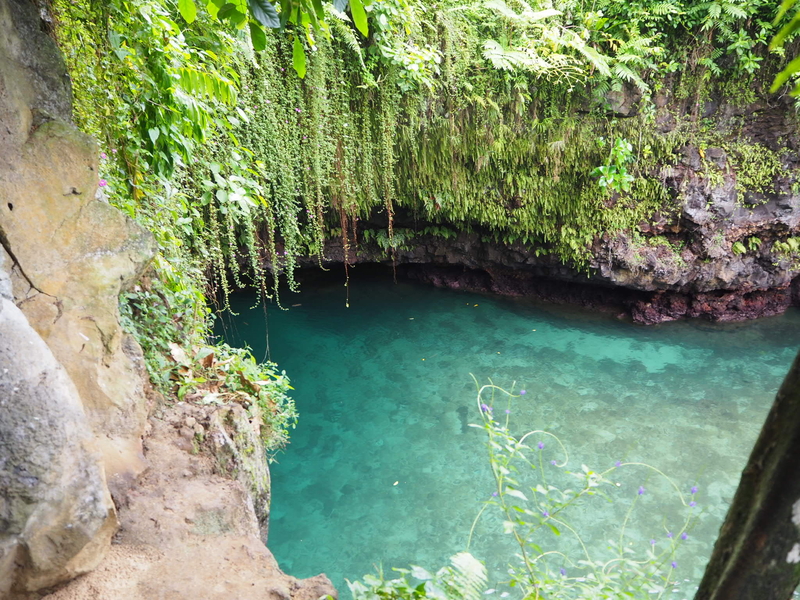 The To Sua Ocean Trench is a giant swimming hole set amidst tropical greenery consisting of two giant holes joined by an ancient lava tube cave. 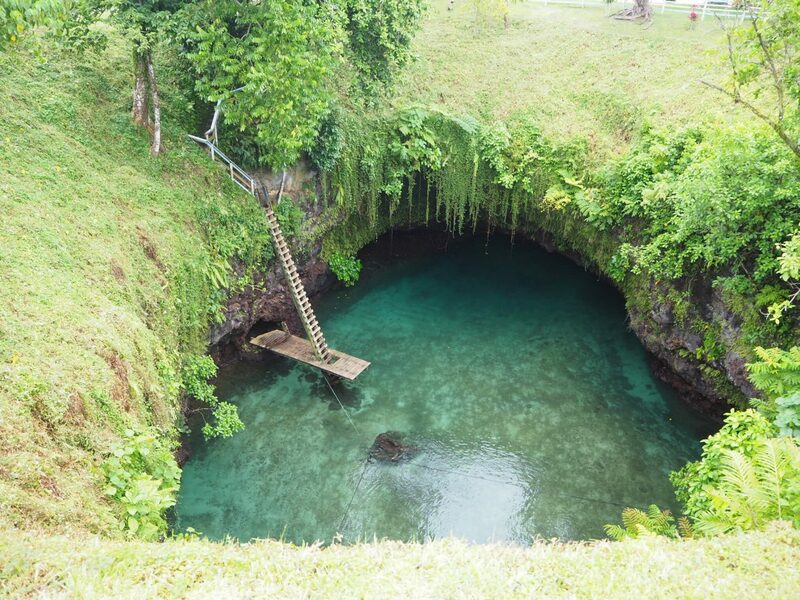 Thirty metres deep and filled with refreshing, turquoise water I was filled with trepidation when I saw the ladder we had to climb down! It doesn’t look too bad on the photograph above but believe me, when you were balancing on the top rung it seemed a very long way down. 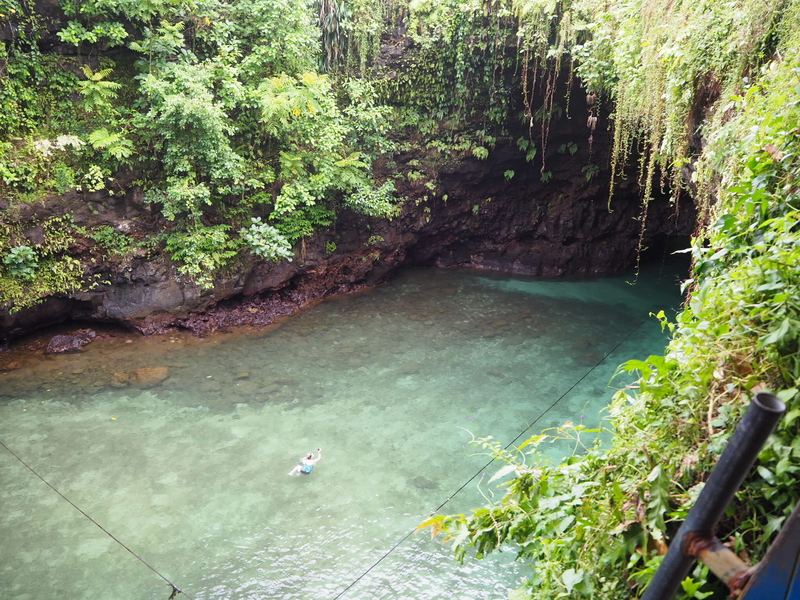 However much our nerves were on edge at the thought of getting down the ladder, there was no way we were going to miss out on the experience of swimming in an ocean trench. Down we went and the water was surprisingly warm and so refreshing. We were among the first people of the day to arrive and it seemed surreal gliding through the water in complete peaceful silence. 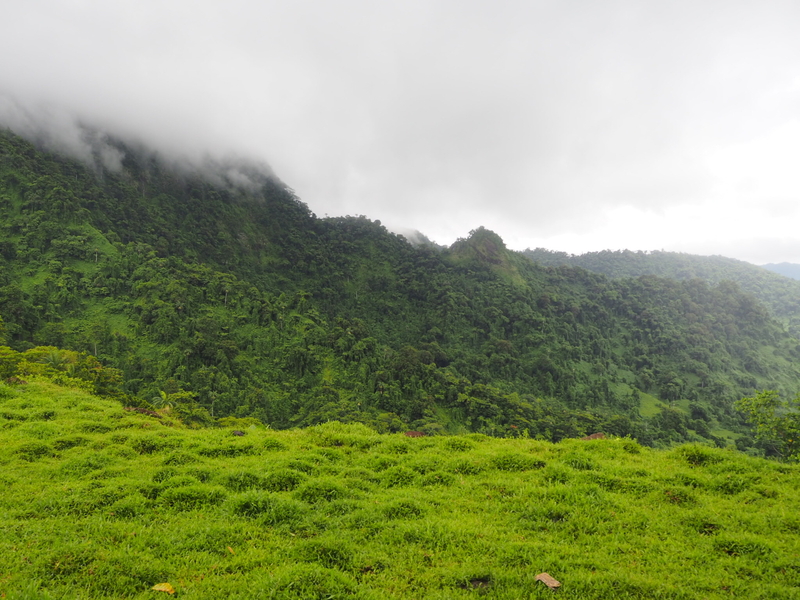 Some of us were braver than others…..
Our next destination took us on the cross island road and through some pretty foggy landscape. 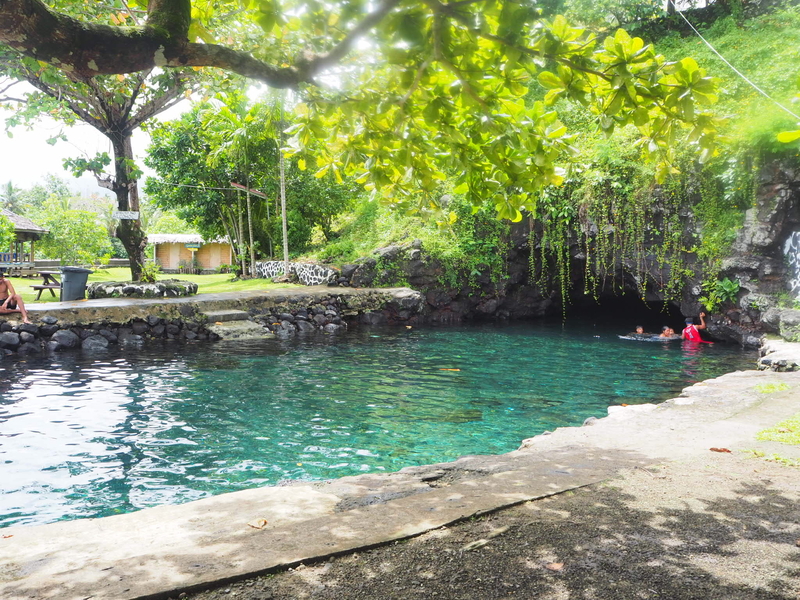 The Piula Cave Pool is situated in the village of Lufilufi. A crystal clear, freshwater cave pool it definitely had more of a chill than the warm waters of the ocean trench. 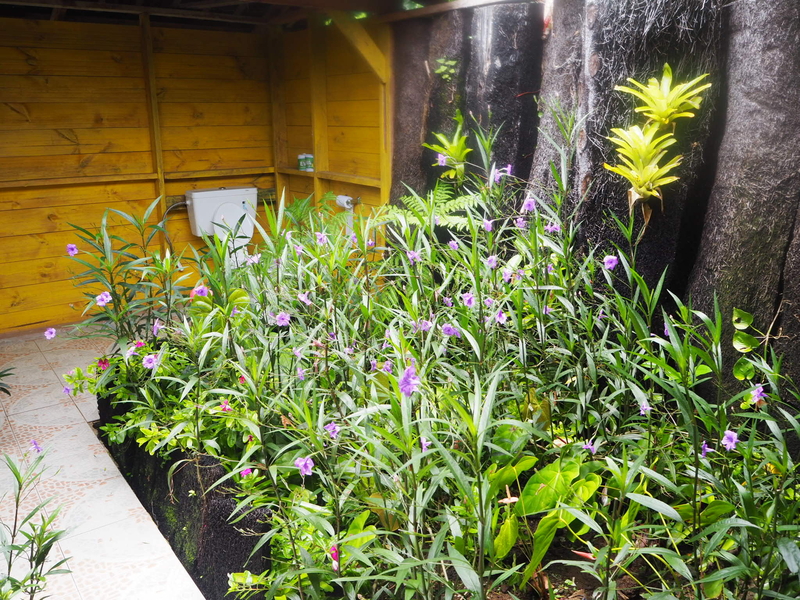 A surprising and unexpected feature of the cave pools were the very attractive public toilets! Set in a garden setting I’d never quite seen public toilets like them. 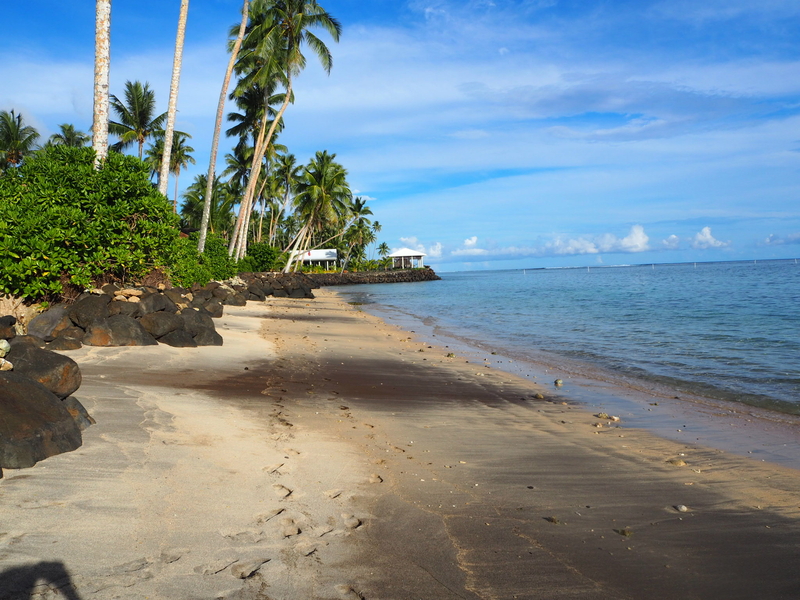 A ten minute boat ride from Upolu sits the uninhabited island of Namu’a. If you are lucky you will spot turtles swimming in the ocean all around the boat. Make sure to take snorkeling equipment as the off shore snorkeling is hard to beat. 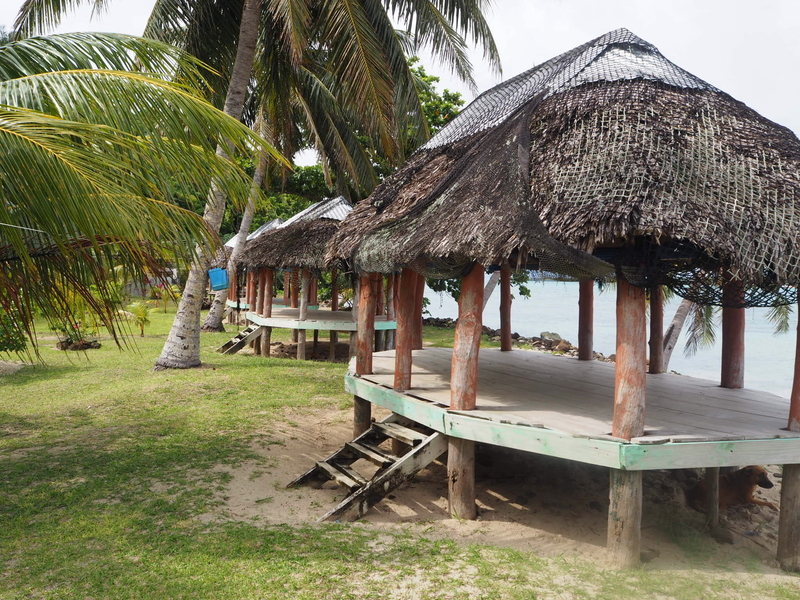 If you don’t mind skipping your creature comforts in exchange for a night on an uninhabited island, there is the option to stay in an open sided fale. A delicious traditional Samoan barbecue lunch is available for 15 tala. Well worth it in my opinion. 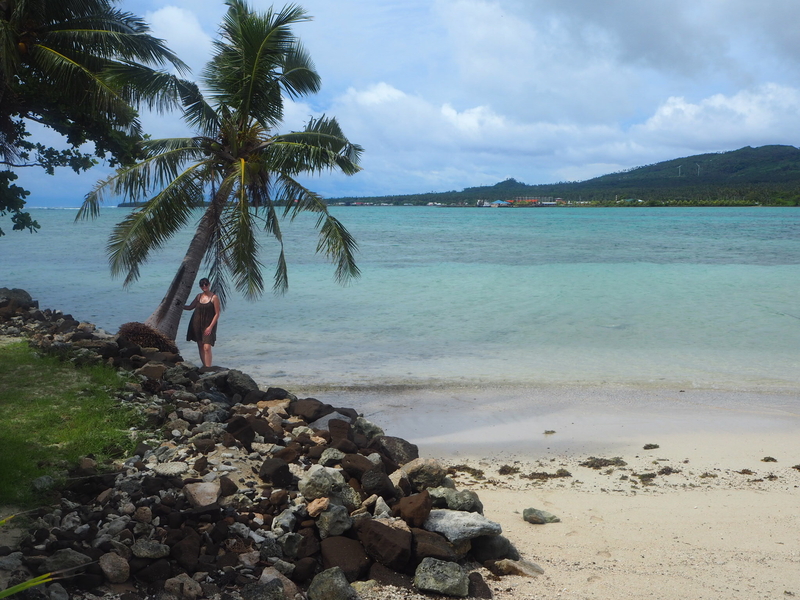 Soon our day of exploration was over and we headed back to the sanctuary of the Saletoga Sands Resort and that beautiful beach. 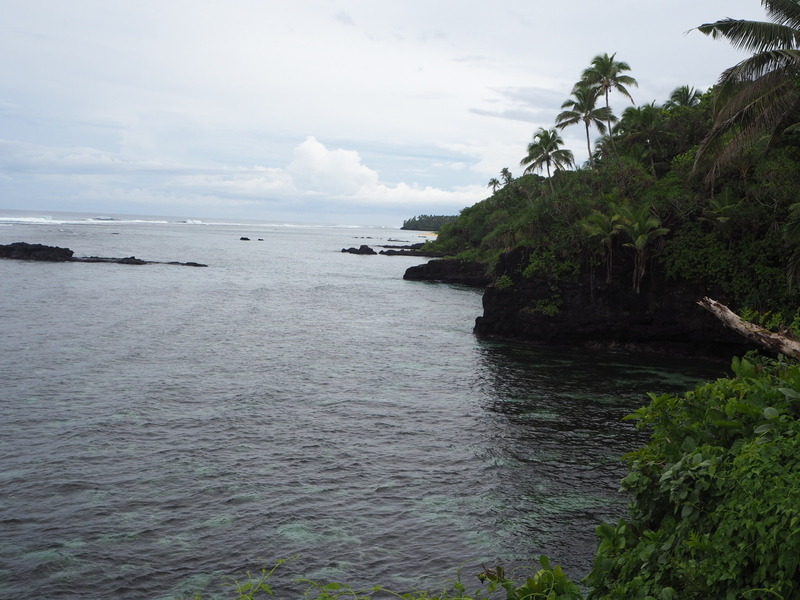 Have you ever been to Samoa? 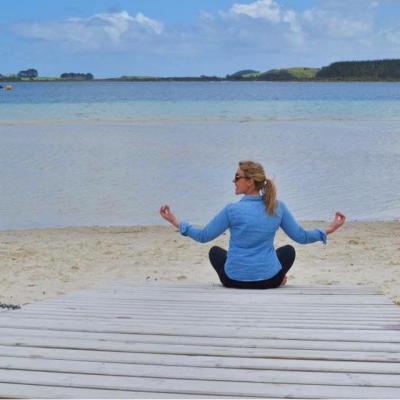 Have you been inspired to visit? I’d love to know!